The processing of leather and the art of tanning is one of the most ancient activities undertaken by mankind– as the majority of children already know. Who hasn’t heard in their first years at school, about how the primitive men during the Paleolithic and Neolithic era went hunting not only to get food to eat but also skins to cover their bodies, to keep them warm and comfortable through those cold and freezing winters? These days the tanning industry in Italy is considered the world leader for its high tech and quality development, its strong environmental commitment and its consistently innovative stylistic designs. It is well known that the most beautiful leathers in the world are produced in Italy, where the tanneries supply international high fashion with the best raw materials. From meat by-product to precious material for the fashion industry and the furniture sector, from the barns and savannas, to the stars and celebrities of the jet set: the success of the Italian tanneries is due to the product itself – innovative, unique in the world, unrivalled – compared to which there are no competitors, especially in terms of innovation and experimentation. In Italy there are about 18,000 men and women employed in the leather sector, with more than 1,500 small and medium factories involved in its processing full time: plus a satellite industry that, if we want to keep on talking in figures, counts another 150,000 workers between the leather and furniture sectors. So, it can be considered an important slice of the Made in Italy concept. Given the quite even distribution over the country of these factories and companies, we can highlight three main centers of leather production and processing, concentrated in the regions of Tuscany, Veneto and Campania: a territorial specialization that has privileged and favored its own development. With a turnover of about 4.3 billion, today tanning is one of the most international Italian industrial sectors, where the export of the tanned leathers covers about two thirds of the total turnover – for Italy, this is a very important share in the global market. But, how can we pass on to the new generation this mixture of technology, artisan craft, passion and devotion towards such an ancient art,? The matter has been considered by the National Union of the Tanning Industry, which has decide to promote this important production sector of the Italian economy with a book of fairy tales, recently presented at the Cultural Commission of the Italian Parliament. The book is primarily dedicated to children but would also appeal to all who are interested in the subject both for simple curiosity and for a typical working interest. 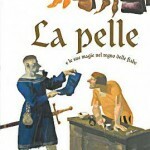 It relates the magic of an art, the transformation of leather, now in the form of fancy shoes like in “Puss in the Boots”, now with a disguise as in “The monkey in the lion skin”, now with the story of good and positive feelings like Pascal Le Maitre’s fairy tale “The Christmas Boots”. 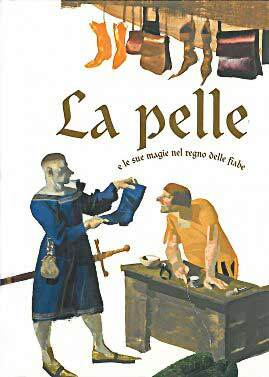 “La pelle e le sue magie nel regno delle fiabe” (Leather and its magic in the fairy tale realm) is the title of the book: an original and engaging way of revisiting the old trades, symbolizing a creative and hard working Italy. It’s a precious and deserving idea for which we have to thank our Italian tanners who despite the economic crisis, are still today the world leaders in the leather sector. Leather, in its general meaning, has a sort of magic ingredient, mysterious, fantastic, thus charming and enchanting. It’s this component that makes it the protagonist in so many stories, stories of leather in particular…..and who better than our dedicated tanners, to tell us these stories and entertain us with these extraordinary adventures? This book is a way to look to the future while keeping an eye on the past, a past of skilled trades handed down from generation to generation with devotion and meticulousness, which has made Italy so famous all around the world. And, with Christmas just around the corner, here’s a good gift idea for the whole family, to gather around and retrace, in the magic of a fairy tale, an important part of our country’s history.